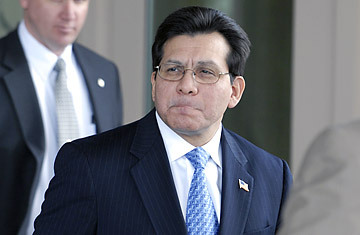 U.S. Attorney General Alberto Gonzales. The Letter: "An Unsuitable Steward of the Law"
In what could prove an embarrassing new setback for embattled Attorney General Alberto Gonzales on the eve of his testimony before the Senate Judiciary Committee, a group of influential conservatives and longtime Bush supporters has written a letter to the White House to call for his resignation. The two-page letter, written on stationery of the American Freedom Agenda, a recently formed body designed to promote conservative legal principles, is blunt. Addressed to both Bush and Gonzales, it goes well beyond the U.S. attorneys controversy and details other alleged failings by Gonzales. "Mr. Gonzales has presided over an unprecedented crippling of the Constitution's time-honored checks and balances," it declares. "He has brought rule of law into disrepute, and debased honesty as the coin of the realm." Alluding to ongoing scandal, it notes: "He has engendered the suspicion that partisan politics trumps evenhanded law enforcement in the Department of Justice." The letter concludes by saying, "Attorney General Gonzales has proven an unsuitable steward of the law and should resign for the good of the country... The President should accept the resignation, and set a standard to which the wise and honest might repair in nominating a successor..." It is the first public demand by a group of conservatives for Gonzales' firing. Signatories to the letter include Bruce Fein, a former senior official in the Reagan Justice Department, who has worked frequently with current Administration and the Republican National Committee to promote Bush's court nominees; David Keene, chairman of the influential American Conservative Union, one of the nation's oldest and largest grassroots conservative groups; Richard Viguerie, a well-known G.O.P. direct mail expert and fundraiser; and Bob Barr, the former Republican Congressman from Georgia and free speech advocate, as well as John Whitehead, head of the Rutherford Institute, a conservative non-profit active in fighting for what it calls religious freedoms. Fein, speaking for the signatories, told TIME that Gonzales' planned testimony to Congress tomorrow, the text of which has been released by the Justice Department, was a "terrible disappointment" that left unanswered key questions on which his job may now depend. "Gonzales' testimony before the Judiciary Committee resorts to a truly Clintonesque defense of his own previous false statements," says Fein. "In fact," he says, "Gonzales' latest declarations really do call into question the forthrightness and honesty indispensable for America's chief law enforcement officer." In testimony to be delivered before the Senate Judiciary Committee tomorrow  and in an op-ed in Sunday's Washington Post  Gonzales says he has "nothing to hide," and that there were no political motives for seeking the resignations of any U.S. attorney involved in the current controversy. He acknowledges that he made various mistakes in the controversy and apologizes to the U.S. attorneys and their families. "I also have no basis to believe that anyone involved in this process sought the removal of a U.S. attorney for an improper reason," Gonzales asserted. "I firmly believe that these dismissals were appropriate." But he did not offer specifics about any of the firings, and specifics seem likely to dominate Tuesday's Senate hearings. Sen. Arlen Specter of Pennsylvania, the top Republican on the committee, said yesterday that Gonzales has a "steep hill to climb" to keep his job, noting that, "He's going to be successful, in my opinion, only if he deals with the [specific] facts." Signers of the letter says that it is also aimed at fellow Republicans  and especially G.O.P. members of Congress  whom they hope to encourage to call for the Attorney General's ouster, a step they argue is crucial to ending damage to the Department of Justice, as well as G.O.P. standing on Capitol Hill. Conservatives have long distrusted Gonzales, but until now many hesitated to criticize him publicly in the current controversy out or respect for the broad latitude they believe a President should have in selecting his cabinet. Behind the scenes, however, their opposition helped dissuade Bush from nominating Gonzales to the Supreme Court and, over the years, they have regularly disparaged him as too soft on key issues such as affirmative action and abortion. But as the President's popularity and political clout continue to decline, the group's assault on the Attorney General is designed to rally a growing number of Republicans who seem to hope that Gonzales will finally step aside. His testimony, however, gives no indication that he intends to do so.